Geithner was condescending, vague and infuriating as he lectured us on the troubled financial system, feeding a suspicion that he's still working for the other side. Treasury Secretary Geithner at a news conference detailing the Obama administrations plans for the economic recovery (2/10/09). The look and tone of the Treasury Secretary reminds me of the third grade. The smartest kid in the class, the one teachers loved, was the boy who always raised his hand and waved it impatiently while some other student fumbled for an answer. If the teacher stepped out of the room for a moment, bedlam usually followed and this kid would try to restore order. “Be quiet or I will tell.” Kids threw things and tormented him until the teacher returned. Timothy Geithner reminded me of that type as he lectured the country on how the Obama administration intends to save the financial system. The country is apparently responding in kind–hurling blistering comments at him and the “best and brightest” who are now in high office. How could these smart people be so dumb about things everyone else already understands? Americans do not need to be told, as Geithner did, that they have “lost faith.” The remark is condescending and infuriates further. What people wanted to hear, in plain English, were hard answers and an honest acknowledgment of the extreme irregularity of events–government is rushing to rescue the very private interests that led us to sorrow. 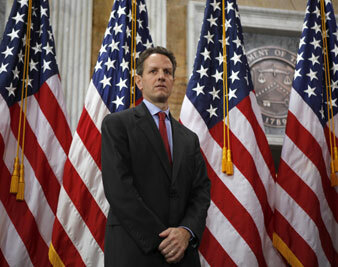 Instead, Geithner told us he has a “plan.” He will share the details at some later date. Be calm. Stay tuned. It’s unfair, I know, to pick on Geithner. Everyone says he is a nice guy and maybe so. But his opacity is staggering and fairly representative of the governing elites in this country. Events of the last six months have transformed the context of American politics and government. People do not need to be told things are bad because the bad things are happening to them. Nor do they need a scolding tone from official Washington, since they also know Washington was fully complicit as the titans of finance went wild. I wouldn’t say Americans have been radicalized–not yet–but the unsatisfying political events are driving people in that direction. So is the lack of honest explanations and the refusal of Democrats and Republicans to confess error or offer apologies: silence feeds a popular suspicion that politicians are still working for the other side. The question about Geithner that intrigues me is why. Why do brainy technocrats like him often seem so clueless (or, if you like, indifferent) to the social reality once they have risen to the top of the governing heap? I think it may have something to do with the experience of being the smartest kid around and being told so from an early age. This could encourage a narrow kind of arrogance, but maybe also insecurity. Over many years, I have seen a certain type both in politics and private life who climbs the slippery pole by applying intellectual firepower and performing for the teacher. Superiors are impressed and always like this dutiful type. Promotions take them higher and higher. Then they get to the top and it becomes obvious something is missing–a capacity to think creatively in strange new circumstances or the human empathy required to lead others. My curbstone analysis could be dead wrong about Geithner but might aptly describe the career path of Larry Summers, Obama’s economic advisor. Summers rose to the top–president of Harvard–on his well-known brilliance and he was done in there by his personal arrogance. He ingratiated himself with superiors on the way up and adjusted his economic thinking to seasonal changes in ideological fashion. He also learned the bureaucratic skills needed for policy infighting–how to cut other economists with opposing views out of the debate. He somehow did so in the Obama White House. This is relevant now because Barack Obama has chosen to rely on Geithner and Summers for managing the economy and reforming it. If they are too narrow in perspective, too defensive in behalf of the failed status quo, the Obama presidency will be crippled by their lack of imagination. That leads to another question: why did Obama feel the need to select such a confining list of familiar technocrats–competent and brainy like himself–to run the government? The president is neither arrogant nor insecure–he exudes the opposite–yet he must feel more comfortable dealing with folks vetted by the same ladder of success. Perhaps he believes the “best and the brightest” will protect him from failure. Or maybe he thinks his presidency will have more power to change things if he sticks with people drawn from among the influential elites, safely aligned with the existing power structure. The fact is, we do not yet know the answer. Events are rapidly revealing the nature of this new president, and we have a lot to learn. We know how smart he is, how easily he empathizes with people across the usual dividing lines. We do not yet know if he is wise enough–tough enough–to lead the country to new ground.